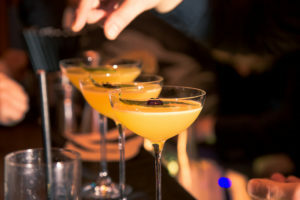 Exciting launch of Meraki Bar in the heart of London – Art, Food, Travel and Fashion! In Greek ‘Meraki’ means to create something with your heart and soul, and Meraki Bar attempts to capture this ‘sixth sense’ or ‘heart and soul’ as an extension of the warm atmosphere, hospitality and high-quality Mediterranean cuisine that diners enjoy when visiting the restaurant. Representing a bit of Mykonos is the resident mascot ‘Peter’ (Petros in Greek), the great white pelican who was the official mascot of the island for years and incorporated in the bar logo. Housed over two floors the main upstairs bar is open to the public where guests can enjoy an after-work cocktail or order dinner at the expansive Carrara marble-top bar. The setting is intimate and warm with rich leafy foliage, exposed brick and vibrant orange walls. A separate secret entrance, located behind a bookshelf, descends into a subterranean bar and lounge making it ideal for a big night out spent under the radar. A unique sixth sensory experience awaits guests once they descend the stairs to the hidden bar below. 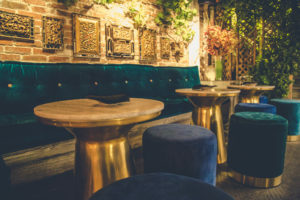 With dim warm lighting, eye-catching tropical wall treatments, and lush velvet seating in rich jewel-tone colours, the subterranean bar can accommodate 50 people standing or 30 people seated for dinner. A late-night menu will be on offer where guests can book tables for dinner whilst enjoying musical beats from international DJs in an intimate environment that makes you feel as if you were lounging in the living room of your most stylish globe-trotting friend. Green foliage, flowers and indoor climbing vines cover the walls and ceilings envisioned by one of London’s top bespoke floral designers, Chantal Flores, who has created eye-catching floral designs for top fashion brands and many of the Waney’s venues in London and internationally. For those not wanting to be seen, the bar offers two private tables artistically built into enclosed caves with velvet curtains that can be drawn for more privacy. The private caves can accommodate 8-10 people seated for dinner with your own personal wait staff. Each cave is outfitted with high-tech lighting and speaker systems that guests can control to play their own music. The bar’s music programme is overseen by renowned French DJ, Malik Alary, who is responsible for creating the rhythmic musical atmosphere at top international venues including Chiltern Firehouse and creating mixed tracks for The Hôtel Costes soundtrack. The late-night dinner menu is an extension of the contemporary fresh Greek fare served at Meraki Restaurant, conceptualised by head chef Athinagoras Kostakos. Kostakos gained famed by winning Greece’s version of Top Chef, and later led the kitchen at the famed beach bar and restaurant SCORPIOS in Mykonos. 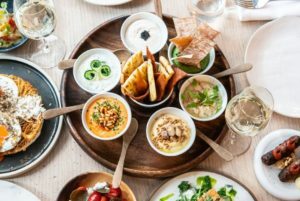 The menu is split into a selection of cold and hot Greek mezze dishes, a seafood menu, and a selection of the restaurant’s most popular signature dishes. Highlights include Santorini Cherry Tomato Salad with thyme, caper leaves and goat cheese, Slow Cooked Veal Cheek with veal sauce and handmade gluten-free Greek traditional hilopites pasta, Charcoal Grilled Lamb Chops with baked aubergines and hummus, Baby Chicken marinated with lemon, mustard sauce, herbs and burnt lemon, and a raw bar of seam bream and octopus carpaccio, prawn ceviche, and beef and black olive tartare. Cocktail highlights include the Black Swan, a term used to describe a rare and unpredictable phenomenon. This vodka-based cocktail combines familiar and exotic flavour combinations to provide a fruity and complex taste. Blended with passion fruit, lychee juice, honey, black tea and basil, and garnished with an edible viola flower. Another cocktail original is the Rosy-Fingered Dawn, a reference to the pink hued skies that symbolize the coming of dawn and an epithet widely referenced in Homeric history. This pink-coloured cocktail gets its hue from a hibiscus rum blend, cognac, Falernum, orange liqueur, pineapple juice and pink grapefruit soda. 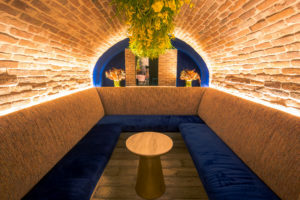 This new hidden haunt is on track to cater to London’s A-list and most fashionable tastemakers where they can discreetly dine, dance, drink and relax as if they never left the comforts of their own home.